THE GENESIS EVENT : NEW DNA EVIDENCE SAYS ITS TRUE? 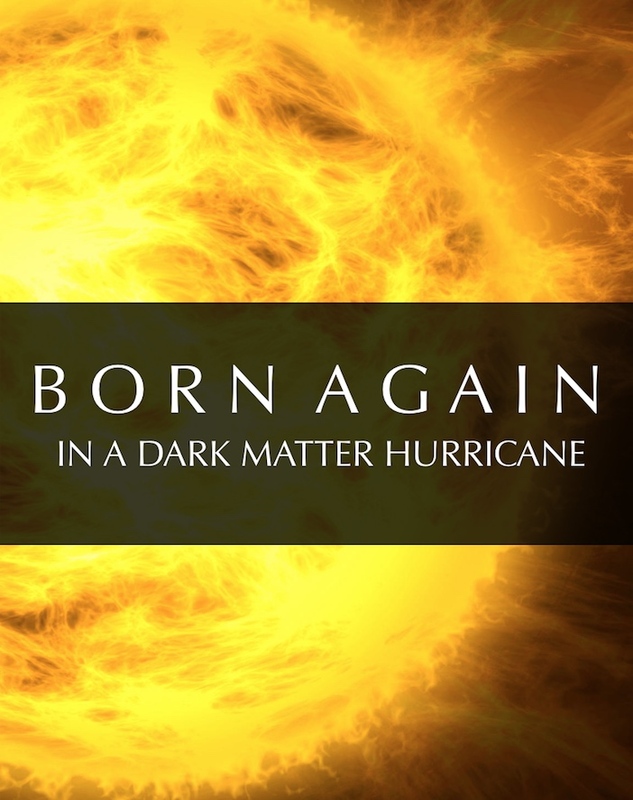 On November 7, 2018 physicists announced that a dark matter hurricane is crashing into earth. It is called dark matter because it is unknown, mysterious, and elusive. But, do not fear this tempest. Wherever you’re headed out to today keep going. But know this before you go. Wise souls think this event could lead to a great leap in our understanding of the universe… and a rebirth of humanity. If you are a spiritual person, or an explorer of mystical mysteries, what I am about to say is mandatory reading as the parallels between dark matter and spiritual realms are stunning. Dark matter could be the stuff of which heaven is made and we are on the verge of being enlightened by it. The dark matter hurricane is the remnant of a galaxy consumed by the Milky Way a billion or so years ago when the two cosmic eggs, two worlds, collided. A stream of 30,000 stars and debris (called S1) from this collision is hurtling at us, pulling dark matter along with it at a mind blurring 500 kilometers per second. Hence, the hurricane metaphor. While earthly hurricanes bring devastation, and while over 30 dark matter streams have passed by in recent decades, this dark matter hurricane is unique in that it will pass through the middle of our solar system sending a large quantity of dark matter through our Sun. Physicists think this may be our opportunity, our day in the Sun, to get answers to the greatest questions known to humanity. Who are we? Where did we come from? Where are we going? In order to ‘get’ the importance of dark matter in our present moment we must first acknowledge something that is well known to science, and often discussed by higher consciousness seekers, but completely unknown to the average person. That is, our solidity is an illusion. Simply, if we think our body, or the chair we sit upon or the computer we gather around is solid we are crazy. Most of what we call ‘solid’ is actually empty space. This has been proven time and time again by quantum physicists. Everything we see in our ‘real’ world — including our planet, me, you, EVERYTHING — is energy made of protons, neutrons and electrons packed together into atoms and made ‘solid’ through quantum level goings on. In reality, nothing is solid about our reality. Quantum physicists have shown that physical atoms are made up of tornado-like vortices of energy that are constantly spinning and vibrating, each one radiating its own unique energy signature. It is beyond interesting that the Bible says, “By faith we understand that the worlds were framed by the word of God, so that the things which are seen were not made of things which are ” (Hebrews 11:3). “It is the glory of God to conceal a thing: but the honor of kings is to search out a matter,” (Proverbs 25:2). We are beings of energy and frequency…and we are much more than we think we are. This is equally true at our micro level and the macro level. WHAT/WHERE IS THE REST OF IT? When scientists ‘did an inventory’ of the universe in the 20th century they discovered that our ordinary (visible) world we think is solid, but isn’t, makes up less than 5 percent of the mass of the universe. Where, or better yet, what is the rest of it? Scientists propose the other 95% — the rest of the universe — is made of a mysterious, invisible substance of unknown origin and composition called dark matter held together by an even more mysterious force (discovered in the 1990s to the shock of scientists) called dark energy, of which we know almost nothing. And we think we have a handle on reality? Dark matter doesn’t emit or reflect light, making it invisible to all the physical telescopes, cameras and other sensitive extensions of our senses used by researchers to try and track it down (which is what mystics have always said about the elusive spiritual matter that makes up the universe). The reason we can’t see it is because dark matter could be material created from higher frequencies of light than physical matter. This would explain why it interacts only with matter of its own frequency, and not our frequency. Nonetheless, scientists think (or have faith) it is there. Its existence was confirmed when astronomers observed two large clusters of galaxies passing through each other. 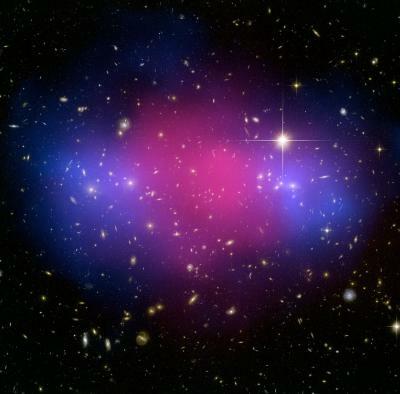 Dark matter and normal matter were ripped apart by the powerful collision of these two galactic clusters. Discoveries using NASA’s Chandra X-ray Observatory and other telescopes provides supporting evidence for dark matter. To write the next chapter of this story, researchers will use detectors to try and pick up axions – elementary particles which are about 500 million times lighter than electrons — floating in S1, the dark matter hurricane that could leave us born again. Reason being is axions, along with the much more undetectable weakly-interacting massive particles (WIMPs), are thought to be a key component of dark matter. Scientists at the Axion Dark Matter Experiment (ADMX), which is located at the University of Washington in Seattle, believe we are a blip away from discovering axions. If we can detect an axion it proves dark matter exists and transforms our understanding of the universe. We will return to this word, axion, momentarily in a deliciously synchronistic way. In fact, in a way that left me awestruck. The discovery that 85-95 percent of our universe is invisible means our world view is inverted. The ‘dark world’ is actually the greater world of light. We are coming to terms with a deep irony: it is our senses, our sight itself, that has blinded us to nearly the entire universe. More, we think we live in the ‘real’ world. But, we don’t. We think we are at the top of the evolutionary ladder. But, we aren’t. In an instant of visionary clarity, it may enable us to…inhale… flip our inverted world view and…exhale… to unveil the greatest mysteries of deeper levels of reality…or even the elusive substance of the divine realms…and the divine beings who dwell there. We would have to ask if dark energy is the same as the chi, prana, Prakriti, and the Holy Spirit of the world’s mystical traditions. Is it the divine manifesting power, as my friend Father Charlie Moore called it? Mystics have long pointed to the existence of an unseen force that brings light to our world and/or holds it together. In ancient Egypt, the mystic pharaoh Akhenaton was famous for introducing monotheism to the Egyptians. In c. 1350 B.C. he introduced worship of the Aton, which was symbolized by a rayed Sun disk. The Aton wasn’t the Sun, however. Akhenaton taught that the Aton was the ‘dark’, ‘unknowable’ light that illuminates the Sun. In other words, its invisible presence could be seen by its effect on the Sun. This sounds like dark matter, which is invisible and cannot be perceived by the five physical senses. However, it does emit gravity and its gravitational effects can be “seen” or detected by the technological extension of our senses. I wonder if dark matter is also what the Essene’s Teacher of Righteousness, whom they called Maskil, “the Enlightened”, meant when he taught the great mystery (called raz, phonetically rawz) to these Jewish-Buddhist mystics, a teaching that transformed them into angels or perfect ones and granted them access to hidden realities. Just imagine angels made of dark matter (and therefore invisible even when standing next to you) coming and going from the heavenly realm and taking on flesh and blood bodies and you have the core of the Essenes Dead Sea Scrolls. Raz refers to knowledge beyond the veil, a whole realm of divinity, which underlies the world of our sense-data and which is present and active in all that exists. This is the dark realm. As scientists say, when we discover the secrets of dark matter we will be raised to a whole new level of universal consciousness. Yes, the Raz will raise us. When we see beyond the veil we are born again as spiritual beings. As it speeds past the sun this is the promise of our dark matter hurricane. It will give us the best ever look at the substance of which God is. When it is over we will know our earth is not just an island in a stream, but an entire ocean of a divine cosmic substance. I have my chair parked on this ocean’s edge. I can’t help but marvel at the timing of the dark matter hurricane and our search for axions, occurring as it is during our time of apocalypse. This often misused word, apocalypse, means ‘to lift the veil’, but it is also a genre of sacred literature in which heavenly knowledge is transmitted to humans via a heavenly being. It is difficult for us to comprehend the magnitude of the change that is upon us. We are transforming in order to leave the earth (before it is too late), to enter the heavenly kingdom of light, and in order for humanity to be born again. Three paths are before us for entering the heavenly kingdom. One is a spiritual path of apocalypse (lifting the veil), resurrecting and ascending to be born again in spiritual bodies of light living in a world that is presently dark to us, but is actually light (the light of which transforms the earth). The second path for humanity is an escape in a Noah’s ark by a few to a nearby habitable planet or possibly a horrible one like Mars. Even a non scientist like Bernie Taupin knows Mars ain’t the kind of place to raise our kids. The third is a shift to a robot body that can live on/in the ‘new earth’ leading to a transition to life in a simulated reality. All three solutions are currently in progress. For those who choose option one, Jesus’s discussion with Nicodemus informs us of the importance of the insight into elusive secrets of dark matter our hurricane potentially brings. It was night in Jerusalem. Sometime around spring 30 AD. Only hours before meeting him Nicodemus watched Jesus throw the money lenders from the Temple of Solomon.…and/or raid the holy of holies of the Temple for its stargate secrets (depending on which version of the story you prefer). A few days later he would find himself in the company of two Angels of the Lord who came down out of heaven (the dark realm) to witness, or assist in, Jesus’s translation into heaven and the transformation of his earthly (‘dark’) flesh into celestial (‘light’) flesh that matched their own. After the money changer demonstration Nicodemus rushed to Jesus under cover of darkness. Nicodemus told Jesus that the Temple authorities knew that he was a teacher who had come from God. ‘No one can do these signs that you do apart from the presence of God’, he told Jesus a few verses before (John 3.2). Nicodemus believes Jesus is a teacher sent from God, a being from another realm, the dark realm of Light. The followers of Jesus, especially the Essenes, believed he came from this realm beyond our ordinary perception and that humans could transform into angels. As we will see momentarily, Jesus instructed Nicodemus in how to do this. As a ‘secret disciple’ of Jesus Nicodemus likely knew that the Essenes had been calling in a high celestial being who would reveal secrets hidden from mankind. The Qumran archives reveal the Essenes were obsessed with human transformation into holy ones or angels (with whom they were living) and were preparing for the coming of a Messiah who would show the way to a new, perfected or angelic humanity that ascends to and lives in a celestial city. More, the Scrolls show they sought to attain an elevated state of wholeness or holiness, enabled by the revelation of the raz, in order to transform earth into a plane(t) of righteousness. Once this mission was accomplished, they sought to ascend from earth life, enter the transcendent and ethereal city (called the New Jerusalem) and join the angels gathered in joyful assembly and the just humans made perfect in the loving service and worship of God. I have commented on this transformation in other articles. Here, I note that this ascended realm of perfected humans sounds a lot like the dark matter world to me. This Kingdom is ‘dark’ to all who are in the dark about the spiritual nature of the universe, as is Nicodemus. Nicodemus wonders whether a man can enter into his mother’s womb again and be born (…again…and again). Jesus answers in verses 5–8 that he is talking about a spiritual birth and that unless you experience it, you will never enter the kingdom of God. This is an important statement in light of our present drive to migrate to space and to enlighten ourselves about dark matter and dark energy. At this very moment we are seeking to cross over the veil and go where the Bible says flesh and blood cannot go. The human body as we know it is not present in any of these scenarios. Indeed, we are finding Paul’s statement that flesh and blood cannot inherit the kingdom of heaven (1 Corinthians 15:50) to be a statement of scientific fact. Outer space and our fragile bodies do not go together. The question for our time is whether or not transhumans or robots, a second alternative state of being for space migrators, can be vessels for the holy spirit. (Bluntly. 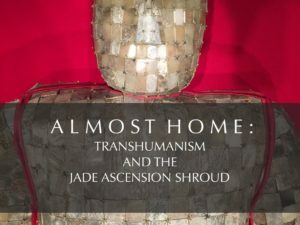 Can transhumans or humans who are part flesh and part silicon ascend? I want to say the Bible says no, but the answer may be yes (as I discussed in my article Pinocchio and Transhumans : Can Human Puppets Ascend). Jesus is telling us that if we wish to migrate to the dark realm — either of outer space or the dark matter realm — a transformation is mandatory. We must transform our flesh and blood bodies into spiritual light bodies in order to live in space or to merge with the dark matter realm of the angels. We must be born again in bodies of spirit…and spirit may be dark matter. The question is, how do we do this? “The wind blows where it wishes, and you hear the sound of it, but cannot tell where it comes from and where it goes. So is everyone who is born of the Spirit,” says Jesus. Again, the description of Spirit matches dark matter and dark energy. It blows where it wishes and you ‘hear’ the sound of it, but cannot tell where it comes form and where it goes. In verse 9, Nicodemus is dumbfounded, and asks Jesus, “How can these things be?” How can something invisible transform the visible? Jesus answered and said to him, “Are you the teacher of Israel, and do not know these things? Jesus marvels at the dimness of his disciple, but realizes his teaching could sound like it is something from another universe. The ‘name’, Jesus/Yeshua, is a frequency or vibration. In order to carry this name the Essenes claimed we must purify our hearts and transform into angels. Jesus has taken Nicodemus as far as he can, by way of explanation. He can’t go any higher. To enter the dark matter realm of light Nicodemus must raise his frequency. As the Essenes taught, and Jesus emphasized in the Beatitudes, an impure heart cannot see God. Only the pure of heart will see God (Matthew 5:8). This is why if Nicodemus is to comprehend the mysteries matter of the Spirit (dark) world he must unite his heart and mind. All of Christianity hangs on what Jesus does next in verse 13. What is Jesus going to do with Nicodemus? What would you do if someone you loved just wasn’t getting it? Is he going to say, “Sorry, Nic. Since you don’t get it, and haven’t done the mystical work required to get it, I don’t have any more time for you”? Come back after you have been born again, and I will give you the explanations you want. That’s not what Jesus says or does. What he does is hugely important for us to see — important for our own ascension and for those who desperately want to be born again by finding an axion in our sun. In verse 13 Jesus stops the lecture about matters Nicodemus is in the dark about and gives a direct how to receive the Spirit. First, Jesus admits he is from heaven. Nicodemus now understands that the reason Jesus can talk about heaven — or knows so much about this dark matter — is that he has come down from heaven. In other words, Jesus has come from the dark matter realm, the Land of Light. He will now tell Nicodemus how he can enter the kingdom of heaven (verse 5) himself. That’s what the Son of Man came to do. That’s what the Essene teacher came to do. 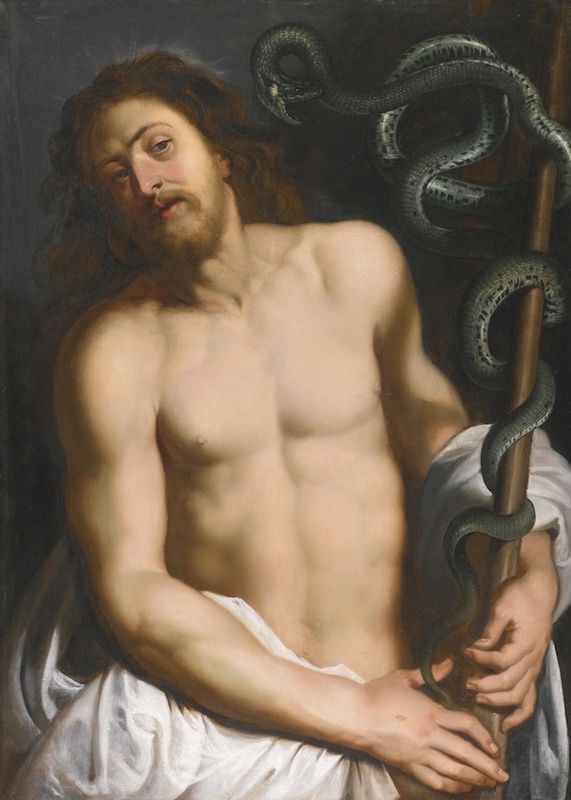 Comparing himself with a serpent is shocking to many Christians. Isn’t the serpent the symbol of evil? So Moses made a bronze serpent and set it on a pole. And if a fiery serpent bit anyone, he would look at the bronze serpent and live. Who or what are the fiery serpents? Ellicott’s Commentary says the Hebrew for the serpents is seraphim (i.e., the burning ones). The word appears to denote a particular kind of serpent. Some think that they were so called because of the bright fiery red upon their heads; others because of the blazing sunbeams on their scales; and others because of their inflammatory and poisonous bite. Apparently there were many of these creatures tormenting the Israelites. But, Moses has the remedy. The remedy is a sculpted metal serpent, a work of art, called the Nehushtan. When the Israelites looked at it they were healed. The Nehustan is a work of art, but it is also a device (a sign, symbol or seal) that transmits a healing vibration. Jesus told Nicodemus that this work of art, this device, is the secret to eternal life. 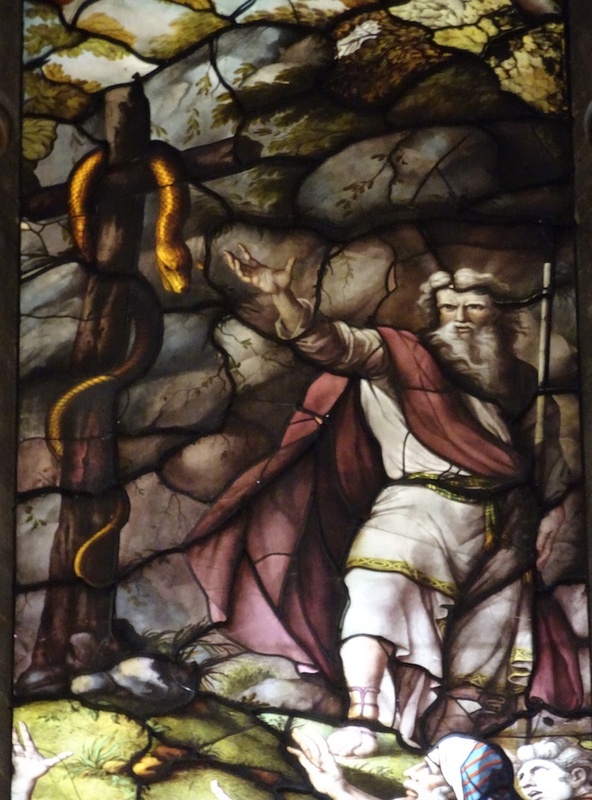 Moses lifts the seraph serpent in the wilderness. Salisbury Cathedral. Photo © William Henry. 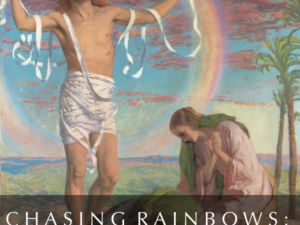 How can a piece of art heal us and hold the key to our ascension? Answering this question is the life work of my wife, Clare, and me. We call it the “sacred art of living ascension“. So, where is this artifact and why don’t we know about it? 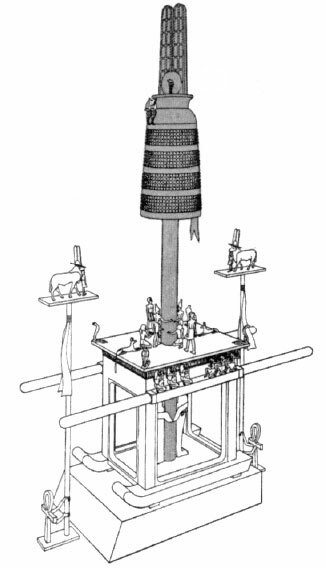 After its construction in Numbers 21, the artifact of the seraph on the pole, the Nehustan, was preserved for centuries, through the times of the judges and the kings. During a changing of the gods in Jerusalem in the 8th century B.C., it became an idolatrous symbol of worship. Hezekiah is recorded to have “removed the high places, and brake the images, and cut down the groves, and brake in pieces the brazen serpent that Moses had made: for unto those days the children of Israel did burn incense to it: and he called it Nehushtan” (II Kings 18:4). This tells us the serpent on a pole artifact was once in the Temple of Solomon, but it was brake into pieces, meaning it was disassembled. Jesus is inferring that he has reassembled this device or that he is telling Nicodemus how to put it together himself. As I have explored in my book, “God Making”, there are seven levels of interpretation of myth and scripture: the literal, historical, metaphorical, allegorical, astronomical, anagogical (having to do with ascension) and the anatomical. The Essenes, who called themselves the Children of Light, understood that the holy temple in which the serpent that is lifted is found is the human body and brain. The upright pole or pillar is our spinal cord. The Nehushtan describes a spiritual process of lifting the serpent within. The serpent that is lifted upon this pole is spiritual energy — the Holy Spirit, chi, prana…dark matter…Christ. 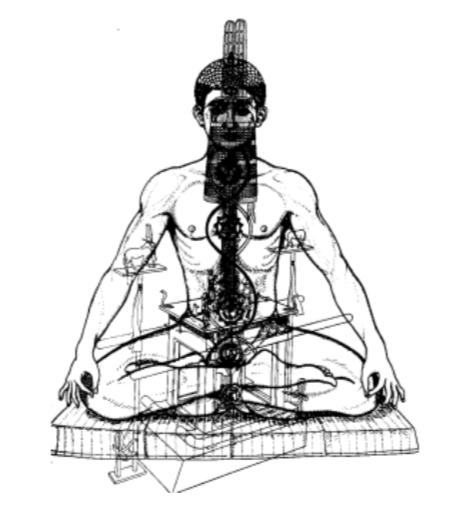 In deep meditation practices, spiritual energy (kundalini, Holy Spirit) rises through the spinal column and proceeds to open the seven chakras (seven churches of revelations) along the spine until it reaches the pineal gland, symbolizing a spiritually-resurrected — or born again — individual. Such an experience raises the conscious awareness of an individual beyond the senses into the dark, unknown world of Light. This is a real experience that ancient spiritual seekers—even the earliest Christians—were aware of. They called it Pentecost. “Lifting up the Son of Man” is another way of symbolizing the path to Christ consciousness, a state of BEING beyond the senses, emotions, and intellect. This is why, in Egypt, the adepts were depicted wearing the ureaus on their foreheads. It represented the attainment of higher knowledge. The coiled serpent, its head extended, is prepared to spit wisdom. According to Christian mystics, this being, a “human with cosmic Christ consciousness” is the consummation of the evolutionary process. ‘Lifting the serpent’ enables us to see into the dark realm and results in a return to our original state of perfection. 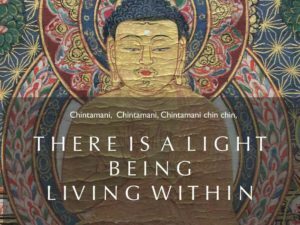 In this state of being we can enter the dark world of Light. The serpent on a pole matches the glyph in the head of Osiris, the Egyptian symbol for the hope for the afterlife. 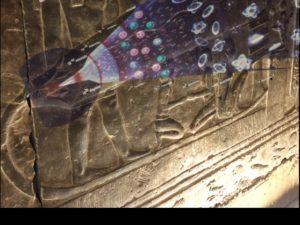 As I have extensively documented in my books and presentations since 1998, the serpent on a pole symbol originates at Abydos, Egypt where it is part of the hieroglyph of the head of Osiris. Like the Nehushtan Osiris was “brake in pieces”. His ‘head’ was buried at Abydos. Osiris is both a man and a device that symbolizes the hope for the afterlife or eternal life to the Egyptians. I liken Osiris to ‘Les Paul’, which is the name for a man and an instrument or device. THIS is the serpent on a pole that Moses made. It is the Tree of Enlightenment, which is why a meditating Buddha fits perfectly ‘under it’. With this concept in mind let us return to a word we introduced earlier. Axion. Remember, axions are what the dark matter researchers are looking for in the dark matter hurricane. Axions are what dark matter is. Synchronistically, Axion Estin is the named given to a hymn and to the miraculous icon of the Theotokos (Mother of God) before which, according to tradition, the hymn was revealed. The center of the icon is domi­nated by the Virgin holding the Child Jesus. Before proceeding we should remember that icons are religious works of art that function as portals or conduits between the earthly and heavenly realms. According to tradition, an Elder and his disciple lived in a cell on Mount Athos. One Saturday night the Elder left to attend the All-Night Vigil in Quarries. He told his disciple to chant the service alone. That evening an unknown monk who called himself Gabriel, came to the cell, and they began the Vigil together. During the Ninth Ode of the Canon, when they began to sing the Magnificat, or the Song of Mary, the disciple sang the original hymn “More honorable than the cherubim, and more glorious beyond compare than the seraphim, without corruption you gave birth to God the Word: true Theotokos, we magnify you. Afterwards the visiting monk chanted it again, but with “It is truly meet…” preceding the original Irmos, the chant that functions as the tie or link to the biblical story. As he sang, the icon began to radiate with Uncreated Light. When the disciple asked the visiting monk to write the words of the new hymn down, he took a roof tile and wrote on it with his finger, as though the tile were made of wax. The disciple knew then that this was no ordinary monk, but the Archangel Gabriel. At that moment the Archangel disappeared, but the icon of the Mother of God continued to radiate light for some time afterward. 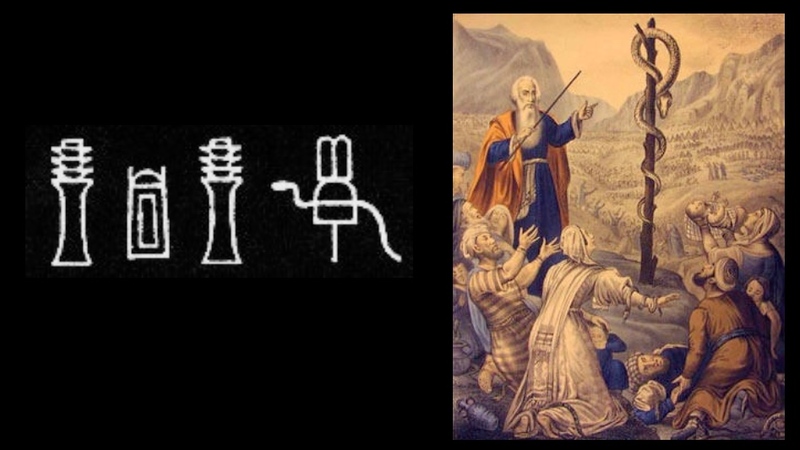 It appears the Axion Estin icon is functioning like the Nehushtan as a device for transmitting the Uncreated Light — dark matter/axions — from heaven to earth. A device is a tool, appliance, instrument and a machine, but also a technique, a plan and/or a symbol. This is not the only example of the Uncreated Light manifesting in the story of Jesus. Immediately after instructing Nicodemus Jesus met John the Baptist who baptized him in the Holy Spirit. Then, Jesus demonstrated his ability to wield the dark matter of the Spirit during his Transfiguration. The light that radiates from Jesus in icons of his Transfiguration is this dark light shining through. This same light was experienced by Moses in the Burning Bush. It dwelt in the holy of holies of Solomon’s Temple in Jerusalem. It rested upon the mercy seat of the Ark of the Covenant and overshadowed Mary when Gabriel, an angel of God, appeared to her to announce she would bear the Christ Child. Christian prophecy says this light that bursts forth in small blips will, one day, transform all of creation (John 17:5). Are we living in that day? I believe we are. Our dark matter hurricane signals it is time for the spiritual action of the axion particles. It is time to be born again. Information picture, like a great puzzle, – nearly complete… but even more magnificent is the energy of Your Soul and Presence, that has full Knowledge Radiance! William, I have read this article twice (what a gift) and will probably read it again. A real…….WOW!…….eye opener. Nikola Tesla was briefly mentioned and I just want to post a website I found interesting. It is not an official A.R.E. website but am thinking still true. The second website was sent to me by a friend on the same day you posted this article. Was Tesla able to pull in that dark matter/energy or did his understanding/knowledge come from many ancient incarnations? Thank you — in the beginning was the Word, carried by the breath, made possible by the Spirit/Dark Matter, which is “breathing me,” not I am breathing myself. Yes, Dark Matter, all the unknowns, miraculously manifesting that which we see/Light. So helpful to have your interpretations of the ancient arts, texts, people. Best of wishes. makes the effort to convert his people to a monotheistic God. Most people don’t know that Agatha was a debout Christian, penning a few books under a pseudonym. They did not sell well enough to suit her publisher, so they discouraged her from writing more. It was clear from reading the book that it was her opinion that Akhnaton was a “true believer”. Once again Henry I love your Gnostic wisdom.In simple langrade could you explain just who is the SON OF MAN and why Jesus would always refer to that.